This Crochet Magic Circle Tutorial will show you a different way to make a Magic Circle. The Magic Circle or Magic Ring technique is a very useful skill to know. It can be used to in place of crocheting into a chain and will result in a closed ring at the bottom of your work. The Magic Circle is often used to begin Amigurumi and other crochet stuffed animals. I use this technique in my Quick and Easy Bowl Cozies, Easter Egg Cozies, Sturdy Bottom Basket, and the On-The-Go Bottle Carrier. One day I was talking with some friend in the Our Crochet Journey Facebook Group and they were telling me that just never understood how to make a Magic circle. This confused me, because the technique was so easy. I hunted down some Youtube Videos to see what the matter was, and I discovered I have a different method when making the Magic Circle. So I am going to show you how I do it. This Magic Circle Tutorial is different than the common technique but hopefully you will find it easier. Let me know in the comments below if you like this Magic Circle technique. While you are here check out all the Free Crochet Patterns! The traditional way or common way to make a magic circle is to wrap the yarn in a spiral then use your hook to grab a certain thread, pull it up and make a slip stitch, then chain and work into the magic circle. Once you work your first row you pull your tail end and it pulls the center of the circle tight. You do not make a slip knot in this method. I am not sure where I learned to make a magic circle, but the photos below show how I have always made a magic circle and I find this way very easy. The main difference between this method and the common method is that I start with a slip knot and with the yarn on my hook. For this Magic Circle Tutorial you will need to know the difference between the yarn tail and your working yarn. When you make a slip knot you will have yarn on each side of the slip knot. The shorter side is the yarn tail. The longer side that is mostly likely connected to a ball or skein of yarn is called you working yarn. Start the Magic Circle by making a slip knot and putting it on your hook. Take your yarn tail and make a circle like the photo below. Treat that circle like a stitch and insert you hook into it. You want to make sure your hook goes under two strands of yarn. Yarn over your hook and pull a loop back through your circle. Yarn over once more and pull it through the two loops on the hook. This completes our first Single Crochet. Work 5 more Single Crochets exactly the same way. (Or however many single crochets your pattern calls for.) Once all the Single Crochets are complete, pull on the yarn tail and it will tighten up the Magic Circle leaving you with little to no gap in the center of you Single Crochet. From here you can either slip stitch to the first Single crochet or continue working in the round. This will depend on your pattern. 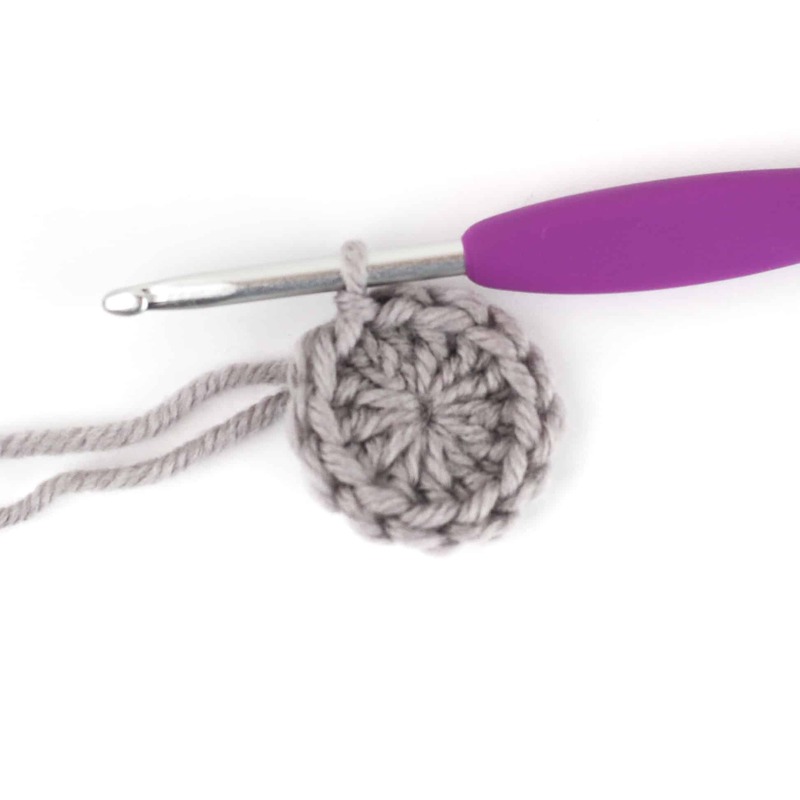 The Half Double Crochet and the Double Crochet Magic Circle are worked the same. For most Half Double Crochet patterns you will start with 9 Half Double Crochet in the first row and 12 stitches in the first row when using Double Crochet. The only difference between this and the tutorial above is that you will Chain 2 before working into the circle. Make a slip knot and put it on your hook. Chain 2, make a circle with the yarn tail. Yarn over, insert your hook in the circle, yarn over and pull up a loop. Yarn over once more and pull that loop through all other loops on the hook. Your first Half Double Crochet it made. Pull the yarn tail until your circle is closed tight. Slip stitch to the first Half Double crochet or follow you pattern as directed. For a Double Crochet circle, you will Chain 2 at the beginning just like the Half Double Crochet Magic Circle Tutorial. You will just work 12 Double Crochet into the circle instead of the 9 Half Double Crochet. And that is it. That is my technique for making the Magic Circle. I have been doing it this way since I first learned to crochet. Did you like this new way to make a magic circle? Was it easier or harder than the other way? I would love if you share your thoughts in the comments below. Check out more of my tutorials while you are here. Written pattern, tutorials, graphs and pdfs of the Magic Circle Tutorial are copyright Windingroadcrochet.com. Please do not reprint or repost this content as your own, but please feel free to share this link with others. You can find more information on sharing my work with others in the Terms and Conditions Page. Never saw it done this way before, but I’ll give it a try next time I need to make a magic circle. Looks easy enough. This is amazing! It reminds me of the long-tail cast-on in knitting. Thank you so much!!! It took me a long time to finally find a YouTube video that I could follow, and finally understand just how to make the magic circle (ring). Your way is so much easier, plus I learned just what it is I am doing when I make the magic circle. I finally figured it out, but I sure wish I had your explanation back then! Proof that your method is easier, you can explain how to make the magic circle, and the reader can follow you. You can’t explain how to make the magic circle, without the aide of a video, using the other method. I love your group too! Thanks for taking such an active role in it! The group has been so valuable to me. I do plan to make a video this weekend, especially to make it easier for the left handers. I’m loving this…I like to pull my circles tight and this way seems to hold the shape better. Thanks! This looks so much easier, and how I kept trying to do the magic circle (but the tutorial pictures confuzzled me, so I gave up). Thank you! Certainly an easy way to make one. I might even remember it , it’s so easy. I love this. It is so easy and simple. Thanks for explaining it so clearly. I always got confused with the other method. I’ll do it like this from now on. This does look a lot easier! Thank you ? Like this way better as starts with the slip knot which helps secure the end as well. I always start with a slip knot except in changing yarns in c2c. This is brilliant – thank you so much!! This is a new way for me so I’m definitely going to give it a try. I always have to watch a magic circle video to get started but this way looks much easier and I think I’ll be able to remember it!! Thanks for sharing and for all your tips and patterns. Appreciate you! This is how I also make mine except I wrap the yarn around my two left hand fingers to make the loop and then I insert and pull the yarn through and proceed like you. Wow I love your method so easy. It took me ages to get my head around the magic circle utube method. This is a breeze. Cheers. Thanks for sharing. Happing crocheting. I am so glad it helps. So much easier! I make quite a lot of amigurumi, and this will help a lot, thank you so much! Thank you for sharing your magic circle. I understand your explanation and pictures! THANK YOU I WILL GIVE IT A TRY BECAUSE EVERY TIME I GO TO MAKE A MAGIC CIRCLE I START WITH A SLIP KNOT I HAVE TO PULL IT OUT ANS START ALL OVER TO WRAP IT AROUND MY FINGERS AND THEN I HAVE TROUBLE GETTING IT RIGHT. YOUR WAY SEEMS A LOT EASIER, THEREFORE THANK YOU. Have a blessing day !! I’ve always done it your way. Great minds think alike. I thought this was the common way to do it, then I started watching video tutorials and found out that I was wrong. So I thought I would share this way since I find it easier. I am so glad to help. I am so glad it helped. It is much easier this way. Thank you for sharing it. Your Magic Circle method is so much easier with same result. After viewing tons of You Tube videos, I will be using your method. Not sure why viewed videos made this more difficult than necessary ;( Thank you!!! Thank you. I have used the magic circle many times. Your method is a nice alternative.